Nearly every business frequently requires workers to load or unload raw materials or finished goods. However, smarter business owners prefer using forklifts for moving heavy objects or containers. From warehousing businesses to construction sites, forklifts have become an essential part of many business operations. You might feel that any business requiring forklifts will purchase these machines directly from the manufacturers. However, the cost of these machines often exceeds the budget of many smaller business enterprises. These businesses typically end up visiting forklift sales to purchase used forklifts. Electric Motor Rider Trucks: Designed for indoor use, these forklifts feature electric motors and rechargeable batteries. They have small tyres. Moreover, they typically have a counterbalance situated at the rear. Electric Motor Narrow Aisle Trucks: This is ideal for use in warehouses, which typically feature narrow confines. These forklifts have unique adaptors. As such, operators could use these for manoeuvring the forks at 90-degree angles too. Electric Motor Hand Trucks: These forklifts are ideal for indoor use. They do not have seats or steering wheels. Instead, the operator uses a control handle for controlling the forklift, while walking behind the unit. Conventional Forklifts: Also known as internal combustion engine trucks, these machines typically run on diesel or propane. They are sturdier than their electrical counterparts as well. As such, they feature multi-purpose tyres and large counterweights for handling hefty loads. Do You Require Authentic Toyota Forklift Parts? Visiting forklift sales could help you find the forklift that fits within your budget. However, unless you’re a discerning buyer, you might end up overlooking various critical aspects of the forklift you purchase. As such, you could end up spending a lot of money on maintaining or repairing the forklift. When it comes to purchasing new and used forklifts, simply rely on Southcoast Forklifts for the best deals. We inspect each machine carefully and keep it in prime condition. Therefore, you can rest assured that you’re getting the best value for your money. If you’re looking for spare parts, we could help with that as well. 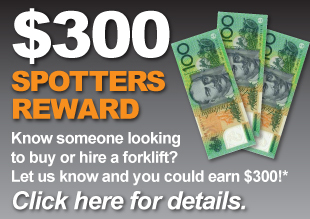 If you need a specific kind of forklift, call us at 1300 988 795.